Whether you are planning a week-long expedition or camping for a single night, having the right equipment for winter is crucial. Snow-covered landscapes can be magically enticing, but trips quickly can turn dangerous—or uncomfortable at the very least—if you’re not adequately prepared. 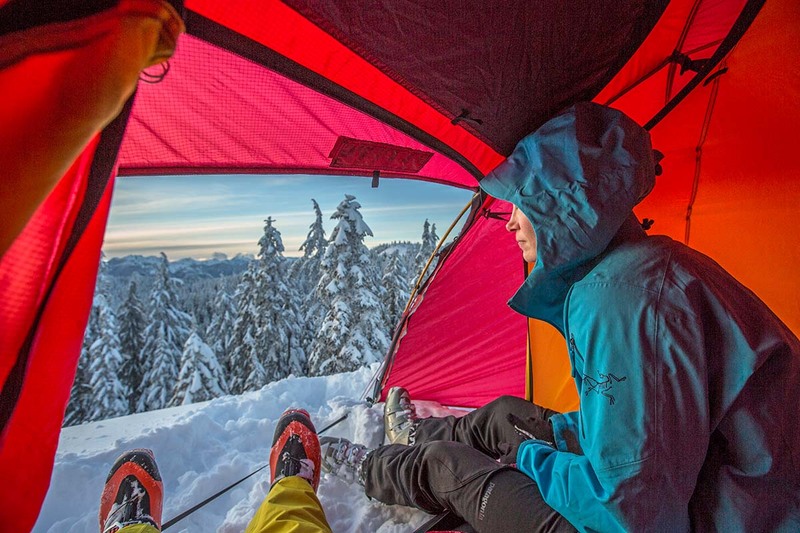 Our detailed checklist below covers critical winter camping equipment like tents and sleeping bags, cold-weather clothing, winter travel gear, avalanche safety gear, and extras you won't want to forget. For more information on each product category, many of the headings link to our category round-ups, which are the result of years of testing and opinions. For all of our recommendations in one place, see our outdoor gear reviews. 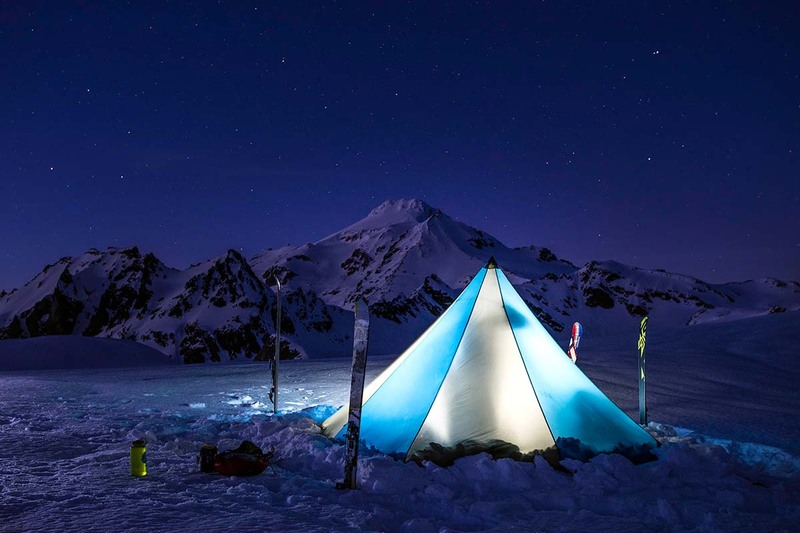 Your tent serves as your shelter and protects you from the elements, which, in winter, can be extreme. 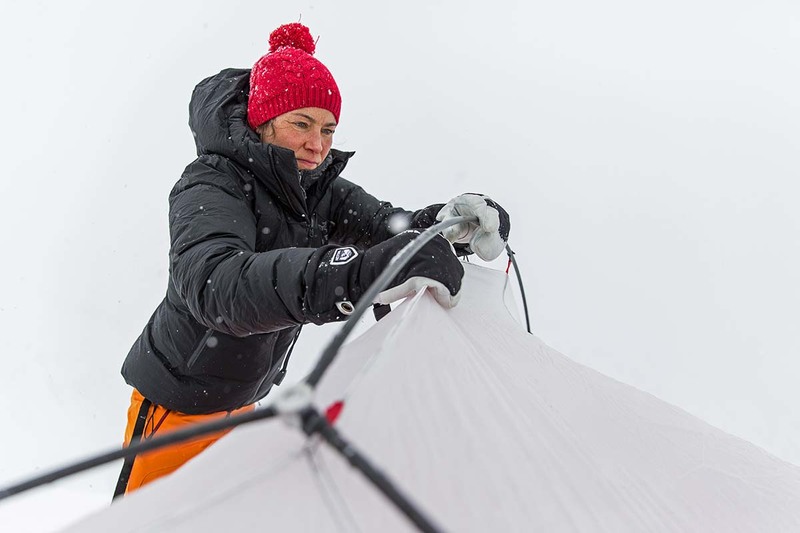 In addition to freezing temps, winter storms often bring high winds and heavy precipitation, and your 4-season tent needs to be able to withstand all of it. Single-wall models like the Black Diamond Eldorado are lighter yet don’t breathe as well as their double-wall counterparts. It’s also worth noting that some winter campers might opt to build a snow shelter. Snow insulates quite well and therefore a shelter can be pleasantly warm inside, even during blustery and cold conditions. That said, we still highly advise bringing a tent along just in case—snow shelters take several hours to erect and require a lot of practice to perfect. There's no better feeling than crawling into a lofty, warm sleeping bag after an exhausting day of slogging through knee-deep powder. 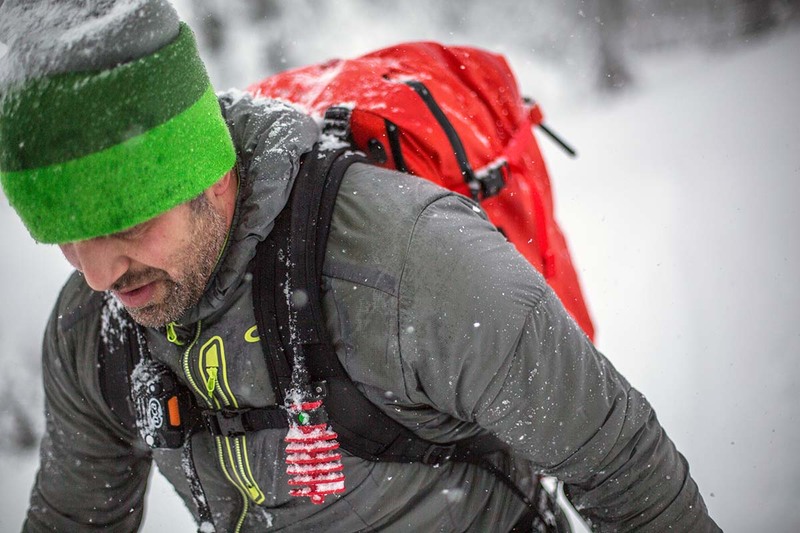 When choosing a winter-specific bag, the conditions you’ll be sleeping in can vary a great deal and the differences in temperatures can be significant. The absolute minimum sleeping temperature rating for mild winter outings would be 20 degrees Fahrenheit, although many true winter bags are rated around 0 degrees or below. One of our favorite winter bag models is the Feathered Friends Snowbunting EX 0, which gets you a whopping 25.3 ounces of premium 900-fill down at less than 3 pounds all-in. And a number of other options from brands like Western Mountaineering and Mountain Hardwear should do the trick as well. Your sleeping pad serves as a buffer between you and the freezing ground, so we consider it almost as important as your bag itself. This is why we choose sleeping pads with high R-values for our winter camping expeditions (the higher the R-value, the more insulation from the ground a pad offers). For cold conditions, consider pads with an R-value of 4 or higher. 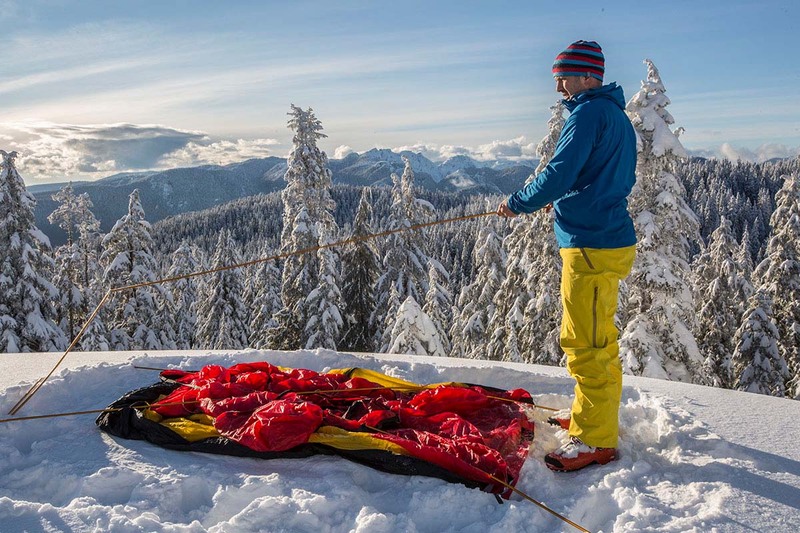 One of our favorites is the Therm-a-Rest NeoAir XTherm: its build mimics an emergency blanket by reflecting your body heat, giving the pad a winter-ready R-value of 5.7 with minimal bulk and weight. And we also love the Exped DownMat Winter, an extremely comfortable sleeping pad with an impressive R-value of 7.0. Meals always are important during high-output days, but even more so in cold weather when your body is working harder to keep you warm. We prioritize a stove that is reliable, can boil water quickly, and will stand up to the harsh winter elements. All-in-one canister stoves are the easiest to use, and we love the MSR WindBurner in particular. After lighting the stove and snapping everything into place, the enclosed burner brings water to a boil quickly, even in gusty conditions. Alternatively, you can opt for a liquid-fuel stove, which has a fuel line that connects to a separate refillable bottle (most often white gas), but is heavier and slower to set up. In terms of fuel, cold temps mean you’ll need to melt snow to make water, requiring more fuel than you would need while camping in the summer. For canister stoves, we recommend an 8-ounce canister for every two days. For liquid-fuel stoves, .5 liters of white gas per day should do the trick. And it’s always a smart idea to bring extra just in case your trip gets extended unexpectedly. Using a camp stove in the snow is surprisingly different and much more difficult than cooking on solid dirt or rock. While using a liquid-fuel stove, for example, the entire body including the legs gets hot, which can quickly melt the snow underneath and create an uneven and unstable surface. And while an all-in-one canister stove may not melt the snow around it since the heat is much higher off the surface, the cold snow will expedite the depressurization process of the canister. Thus, we always bring a platform on which to set up our stove in the snow. The easiest DIY option is to cut a 5x5-inch foam square (you can use an old foam sleeping pad) and wrap it in aluminum foil to reflect heat. 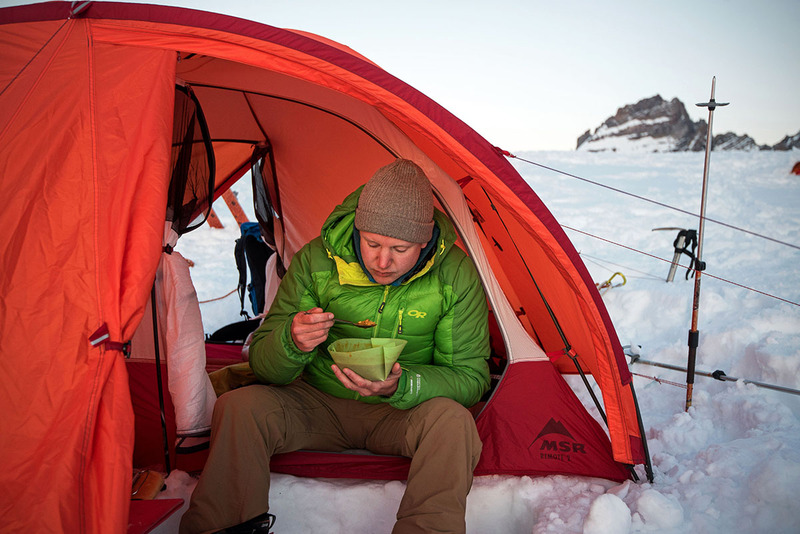 Given the increase in quality of dehydrated meals, many campers use an all-in-one stove system to boil water and eat their food straight out of the bag. In these cases, a pot isn’t necessary—all you’ll need is a spork and a cup or mug for hot beverages. If you choose a liquid-fuel stove, you’ll need to purchase a pot separately, and it’s best to opt for a lightweight option like titanium or aluminum. Cookware ranges from ultralight to budget, but there are a good number of middle-of-the-road options from brands like GSI Outdoors, MSR, and Snow Peak. Days are short in the winter, and we often find ourselves skiing or snowshoeing back into camp as the sun is setting (and sometimes even in full darkness). 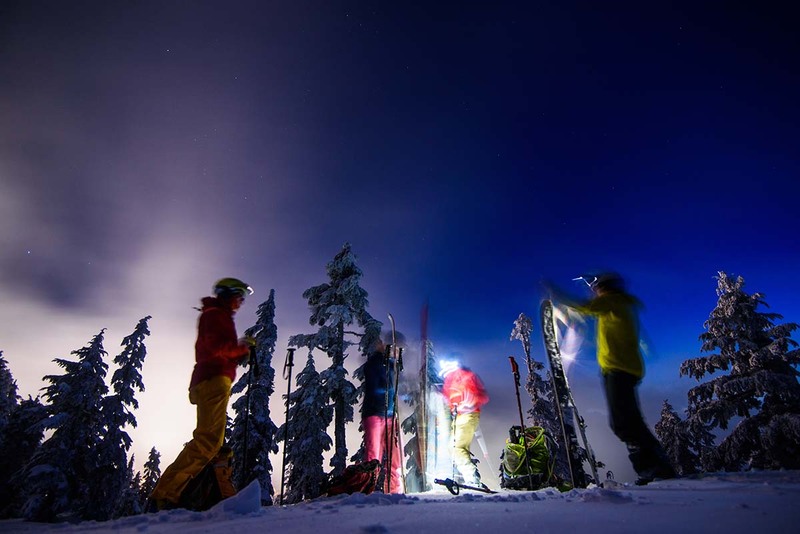 Suffice it to say, a headlamp is a must-have gear item for winter camping. We like the Black Diamond Spot best for its impressive brightness and durability, as well as its reasonable $40 price tag. And the one thing we can’t stress enough: don’t forget extra batteries. Cold temperatures wear down battery power at an alarming rate, so it’s important to have a set or two sets of backups to keep your headlamp functioning. 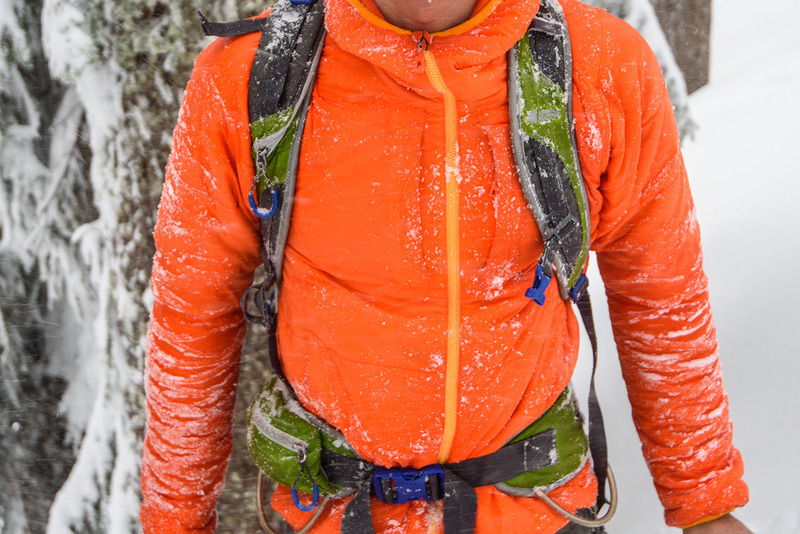 When temperatures drop and the wind starts howling, you’ll need to have a serious insulating layer to throw on. In terms of warmth-to-weight ratio, nothing beats a plush down jacket like the Arc’teryx Firebee AR or Feathered Friends Khumbu Parka. 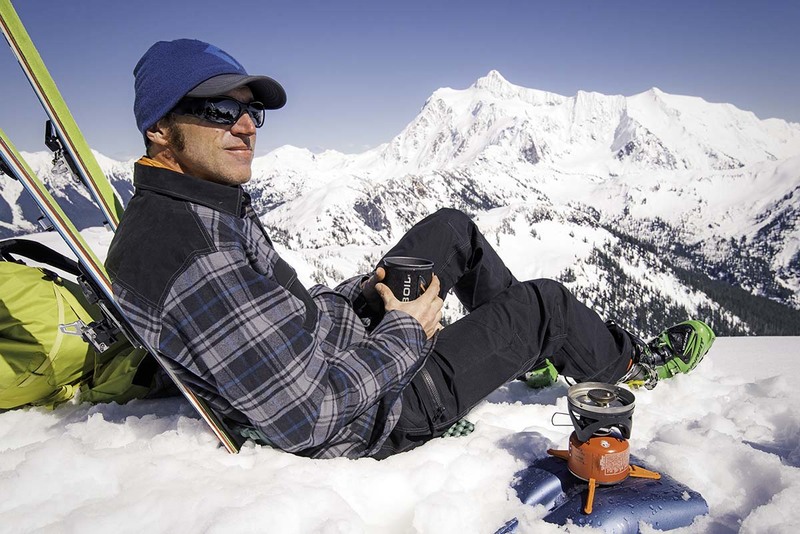 For those on more of a budget, we also like the Mountain Equipment Lightline, which can’t match the options above in build quality or fill power but is an excellent value and should keep you warm even in frigid conditions. For winter conditions, we recommend steering clear of a lightweight down jacket unless it is being used as midlayer—it just won’t keep you warm enough. We love the versatility of a hardshell. We throw it on any time snow turns to sleet and rain, wind starts to seep into our jackets, or we need a bit of extra protection and warmth. 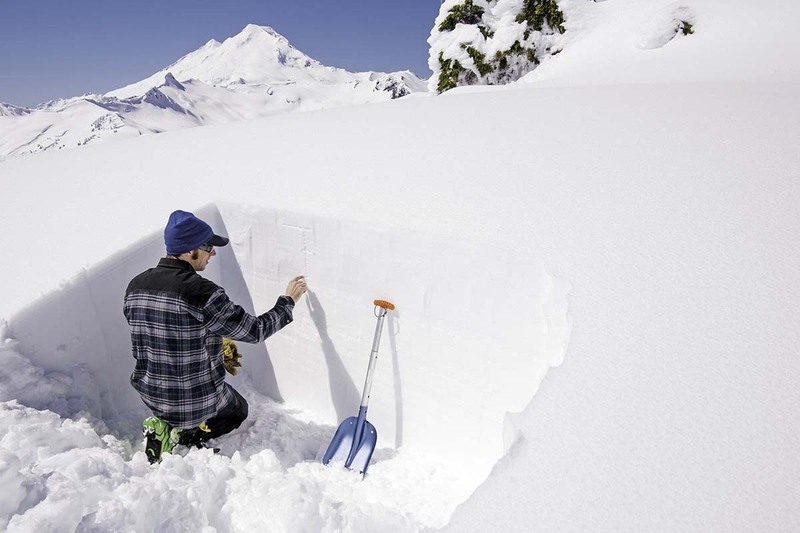 It’s also important to add a waterproof layer while working in the snow, whether building a snow shelter or digging a data pit to evaluate the snowpack. Our top overall hardshell is the Arc’teryx Beta AR, but there are cheaper options like the Outdoor Research Interstellar that pack a lot of the punch for the price. And you technically could bring a softshell or waterproof rain jacket along for a winter camping trip, but they tend to wet out quicker than a hardshell and are much less weather-resistant overall. A good pair of winter trousers will be thicker, warmer, and more weather-resistant than hiking pants. For cold weather, we reach either for hardshell or softshell ski or mountaineering pants, depending on what we need for that particular trip. Hardshell pants like the Flylow Gear Chemical tend to be a bit warmer than softshell pants (especially when they include added insulation), and they have much greater water- and wind-proofing abilities. That said, they don’t breathe nearly as well as the alternatives. Alternatively, a softshell pant like the Arc’teryx Gamma LT (a heavy-duty option on our list of best hiking pants) will be much more comfortable for long days where mobility and breathability are paramount. In freezing temperatures, we also like to add an insulating layer on the bottom. A good budget option is a heavyweight fleece like the REI Co-op Teton Fleece Pants. For a real treat (and if your budget allows), try a pair of synthetic puffy pants. Montbell makes a lightweight and incredibly warm pair called the Tec Thermawrap Pants for $199. 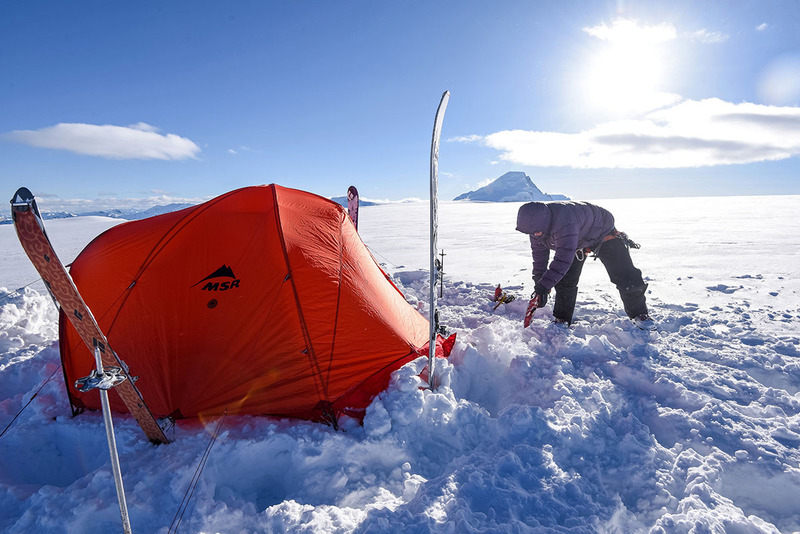 Our baselayers usually stay on for the entirety of a winter camping expedition, so we prioritize comfort over all else. Merino wool is incredibly soft and odor-resistant, while synthetic options will be less expensive but not quite as cozy. If you know that temperatures will be dropping below the low teens, we recommend using mid or heavyweight baselayers, both on the top and bottom. A great middle-of-the-road option is the warm and breathable Smartwool Merino 250 1/4 Zip. For an expedition that will last a few days, one set of baselayers should do the trick, but for a trip that is anywhere from several days to a week, bringing along an extra set usually is worth the weight. We always appreciate having a quality midlayer that goes between our baselayer and shell for easy customization in changing conditions. The best midlayer is one that balances warmth, breathability, and fit. We want it to keep us cozy, dump excess warmth to prevent overheating while we’re working hard, and layer well under our outer shell. A crowd favorite is the synthetic Patagonia Nano-Air Hoody for its impressive insulating power and unparalleled comfort. And if packability is a serious concern, the Arc’teryx Cerium LT is built with mostly down, with synthetic insulation in areas prone to getting wet. Gloves are something we don’t skimp on when it comes to winter camping—we often bring multiple pairs to ensure we can still do everything while wearing them that our non-gloved hands could do. For example, a pair of waterproof ski gloves like our top-ranked Give'r 4-Season Glove is perfect both for traveling through the mountains and working with snow around camp. For tinkering with smaller equipment that requires fine motor skills, we like having a pair or two of liner gloves: wool, fleece, or other synthetic materials do the trick. Liner gloves are particularly important while working with a stove—metal is an excellent conductor of cold and can cause instant ice burn if you touch it with bare skin. A good, warm beanie will work wonders for keeping you cozy, especially at camp. For winter camping, we actually prefer to have two hats: one thin, lightweight option for our higher-output afternoons of hiking or skinning, and one warmer option to switch into at night. Many people also bring along a brimmed hat like a baseball cap for bluebird days, although that is a novelty item. While winter camping, we will often opt for one pair of socks per day. This may seem excessive, but when you have the option of switching out your damp pair for dry, warm socks at the end of each day, we promise you’ll be thanking us. Having plenty of pairs also will help prevent non-temperature-related injuries (like trench foot, which is caused by prolonged exposure to damp, cold conditions) as well as cold-related injuries (frostbite). We love merino wool or wool-blend options, and always stick with ski socks that reach higher up on the calf like our top-ranked Darn Tough Over-the-Calf Padded Light. And don’t forget to save a pair specifically for sleeping. Although listed as an “optional item” on our backpacking checklist, sunglasses are necessary for winter camping. Snow blindness (i.e., sunburn on your eyes) is a major concern, especially at altitude. Even on overcast or partially cloudy days, the reflection of sun off the bright snow surface is intense enough to cause damage. For the best protection, we recommend performance-oriented sunglasses or glacier goggles as they tend to offer the most coverage. Many people traveling into the backcountry in the wintertime also appreciate having a pair of goggles, especially when the objective is skiing steep lines. Goggles also can be helpful for keeping snow out of your eyes during particularly blustery conditions, even while cooking or hanging out in camp. However, note that googles are not to be a replacement for sunglasses since they can fog up quickly, especially during high-output activity. 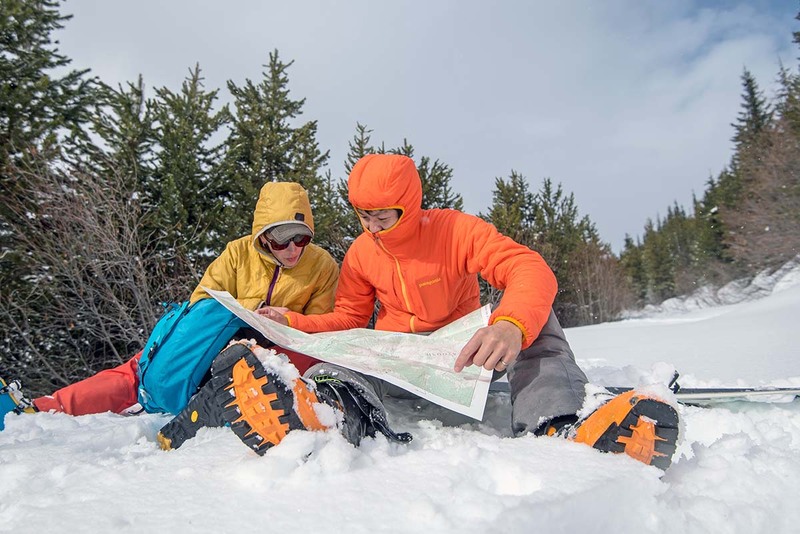 If you’re camping in winter, chances are high you’re going to encounter snow on the trail, and your regular pair of waterproof hiking boots isn’t going to cut it. 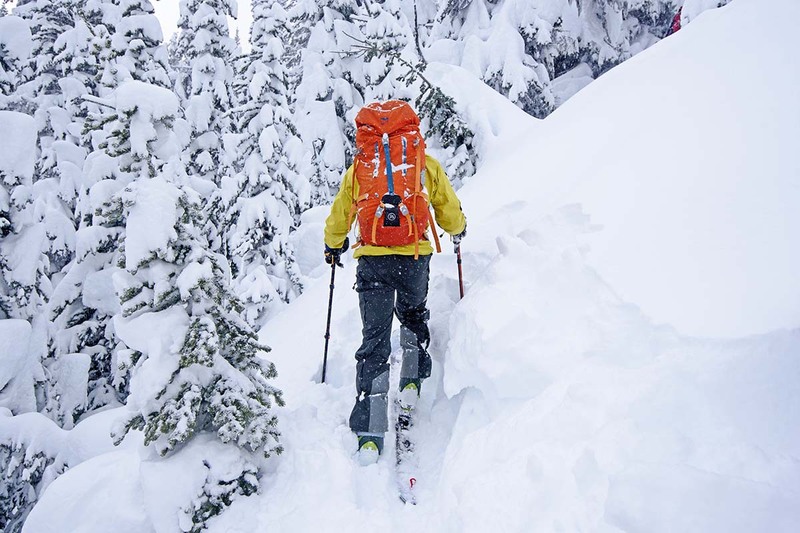 For skiers, lightweight backcountry skis with touring bindings are, in our opinion, by far the most fun way to travel. There are many intricacies in choosing the ideal set-up, but our top overall pick for this season is the DPS Wailer Tour1 106 skis with Salomon Shift bindings. 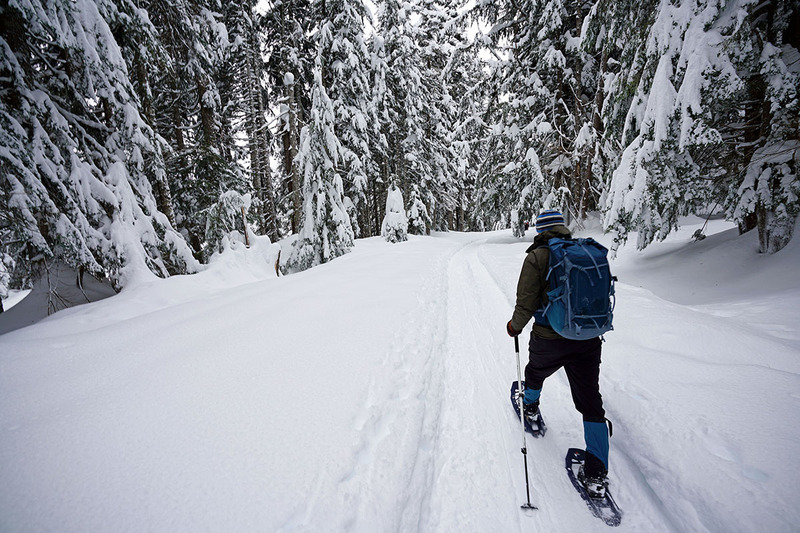 For non-skiers, we recommend snowshoes like the MSR Lightning Ascent and a good pair of waterproof hiking boots to keep your feet dry and on top of the surface. If skis are your preferred mode of transportation, you’ll need a pair of skins to slap onto the bases for easy travel on flats and up hills. Skins allow us to glide upwards without sliding back down. 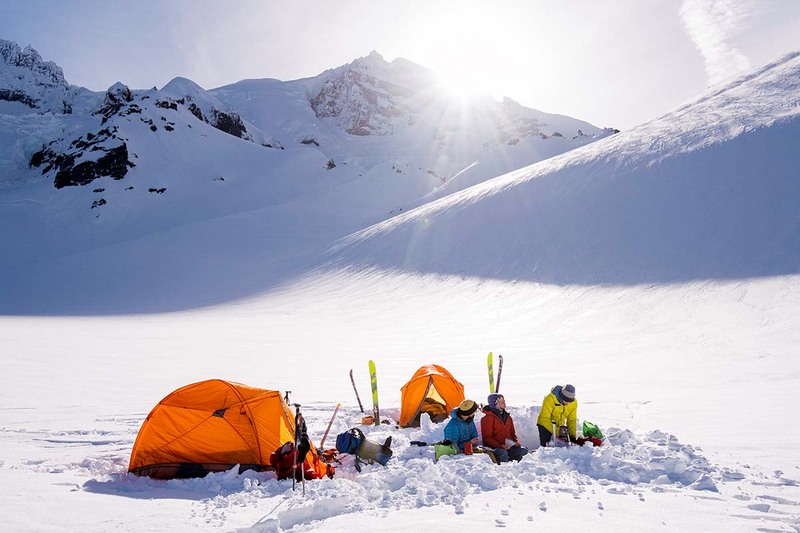 They also make skiing around camp an easy and delightful experience, whether we’re leaving our tent to head to the designated kitchen or going a bit further to use the bathroom. We like skins from brands like G3 and Black Diamond for their solid durability and reasonable price points. 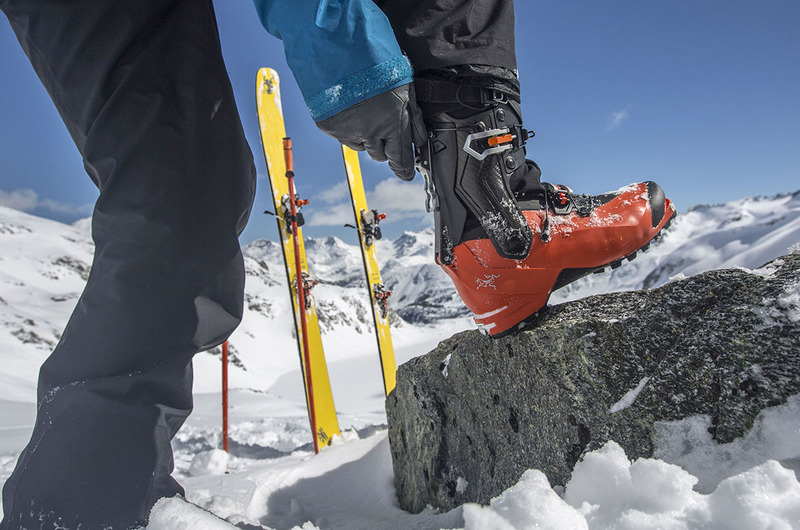 For those traveling on skis, you will need a pair of backcountry ski boots that can be used with touring bindings. If you’re most interested in skiing steep lines, it may be worth your while to go with a slightly stiffer boot like the Scarpa Maestrale RS. 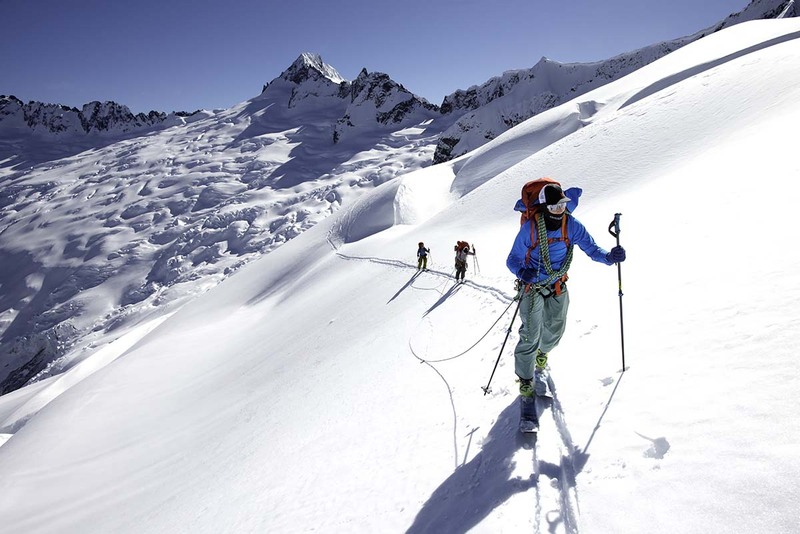 If you’re more focused on lightning-fast ascents with less of an emphasis on the downhill, an ultra-lightweight option like the ski-mountaineering Arc’teryx Procline is a solid choice. There are many boot options that lie somewhere in between these two styles, so we recommend trying on many pairs and choosing the one that best fits your feet and ski objectives. For mountaineers heading into the alpine or onto a glacier, a supportive, protective, and grippy pair of mountaineering boots will be your saving grace. We’ve created an extensive list of our favorite mountaineering boots, all of which offer support while carrying heavy loads, grip confidently over slick rock and snow, keep your feet warm when the mercury dips, and allow for the attachment of skis and crampons (if the terrain is particularly steep or icy). Because winter gear tends to be heavier and bulkier than summer gear, we recommend bringing a larger-capacity pack (anywhere from 50 to 70 liters) than you would for a warm-weather trip. That said, if you’re headed out for more than a couple days and the terrain won’t be particularly steep, a sled and large duffle will make your travels more comfortable. You can throw all your gear into the bag, strap it securely to the sled, and pull it behind you with a tow harness as you ski or snowshoe. 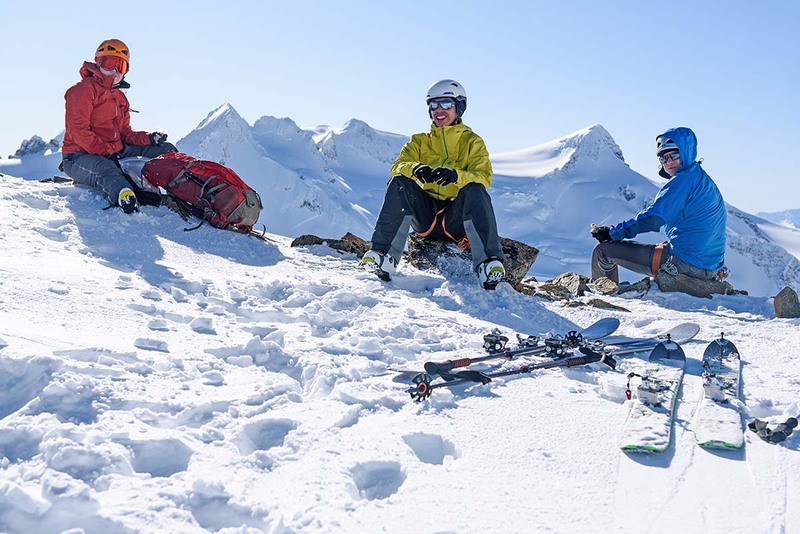 Although fairly pricey (a sled set-up will run you about $300 minimum), we truly love this method of travel on moderate terrain because it’s less strenuous on your backs and knees. If you decide to try a sled out, we recommend bringing along a small daypack for easy access to water, snacks, a warm layer, and avalanche safety gear. For travel days, you’ll be thankful to have a pair of poles with large powder baskets. The poles help you maintain balance and power while moving through the snow, while the powder baskets prevent them from sinking all the way to the depths as you push down. Trekking poles can double as ski/snowshoe poles simply by screwing baskets onto the bottoms. Ski poles that you may have used at the resort also may work, although we do appreciate having a lightweight pair that can collapse and extend, like the Black Diamond Expedition 3 Ski Poles. Route-finding in the winter can be challenging, both because of the potential whiteout conditions and because snow tends to alter the shape and appearance of the landscape. Along with a topographical map, it’s always best to carry a GPS to double-check your location. We also like cell phone apps like Gaia and Topo Maps that track the route, as well as provide offline map-viewing. That said, cold temperatures will kill your cell’s battery quickly, so keep it close to your warm body to maximize its longevity. Bring plenty. Bars are convenient during the day when you aren’t using your stove, but for the morning and evening, nothing beats a hot, hearty meal. 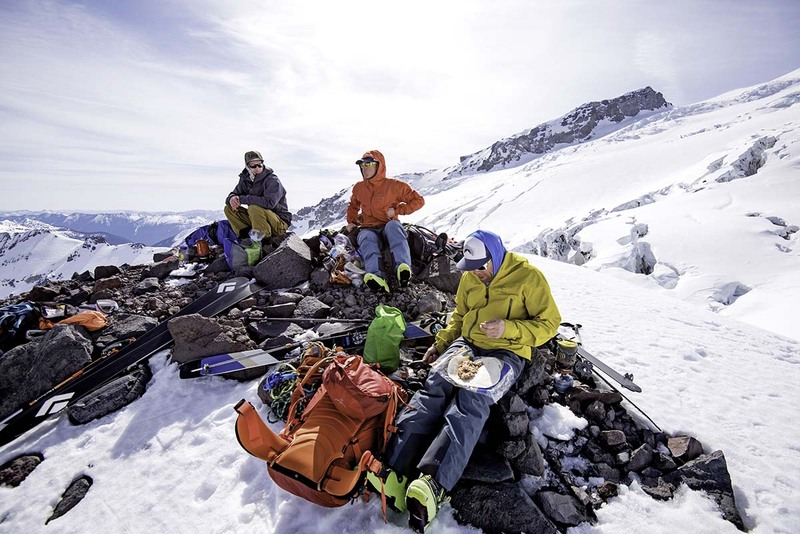 In the winter, you’ll likely burn double the calories that you would during a warm-weather expedition, so don’t be shy when it comes to chowing down. Regardless of your food choices, it’s a good idea to lay out your food beforehand meal-by-meal to make sure it’s all there, and we always pack an extra meal or two (plus snacks) in case the trip takes longer than expected. There’s really only have one way to refill water on winter trips: melting snow. Streams and other bodies of water likely will be frozen, so it’s important to have a bottle (or bottles) large enough to get you through each day. We recommend a capacity of at least two liters per person per day. While a water reservoir is the most convenient option for drinking on the go, the hose almost certainly will freeze. For that reason, we prefer BPA-free plastic water bottles like Nalgenes on our winter trips, and make sure to keep them somewhat insulated in the pack. Similar to backpacking, a first aid kit for winter camping can be fairly simple. If anything serious were to go wrong, your first priority should be to get out of the backcountry and seek professional medical help. At the very least, we carry basic medications, band aids and/or bandages, and duct tape. You also can buy pre-packaged first aid kits from most major retailers. If you’re traveling into the mountains where there will be slopes greater than 30 degrees (you can use an inclinometer to check), we recommend bringing along avalanche safety gear. The three most vital pieces of equipment for keeping yourself and your friends safe are a beacon, shovel, and probe (more on these below). Many serious backcountry-goers also opt to bring along an avalanche backpack with an airbag that will keep them afloat in the unfortunate event that they’re sucked into the hurling snow. And of course, the gear is useless without proper training, so we always advise taking at least a level 1 avalanche course—and practice, practice, practice—before venturing into avy-prone terrain. AIARE offers classes country-wide throughout the winter and early spring. 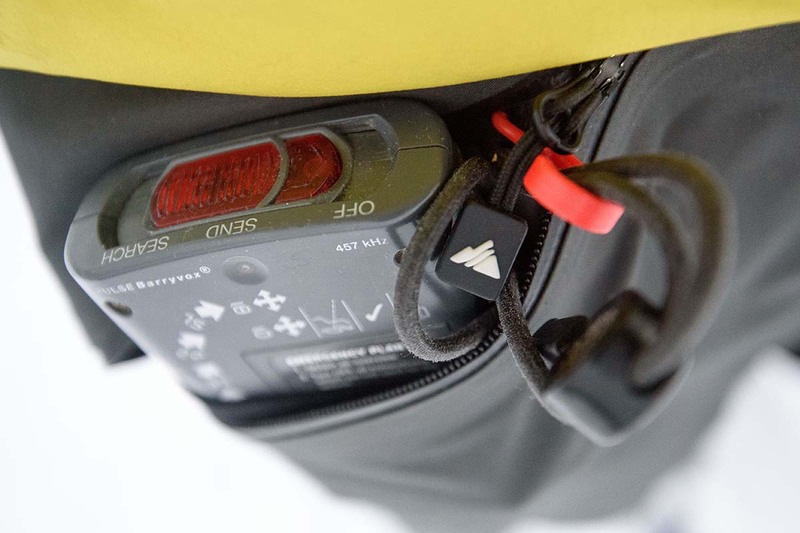 A beacon, otherwise known as transceiver, stays strapped to your torso for the entire day as you travel into potential avalanche terrain. It sends out a signal so that if you were to get caught and buried, your friend could search for your signal with his or her beacon, expediting the rescue. There are many trustworthy beacons on the market, but our two favorites for their ease of use and reliability are the BCA Tracker3 and Black Diamond PIEPS DSP Sport. Once your beacon has pointed you to a buried person, your probe will help you locate them under the snow. Poking around in the vicinity where your beacon has directed hopefully will allow you to feel them underneath and begin digging them out. 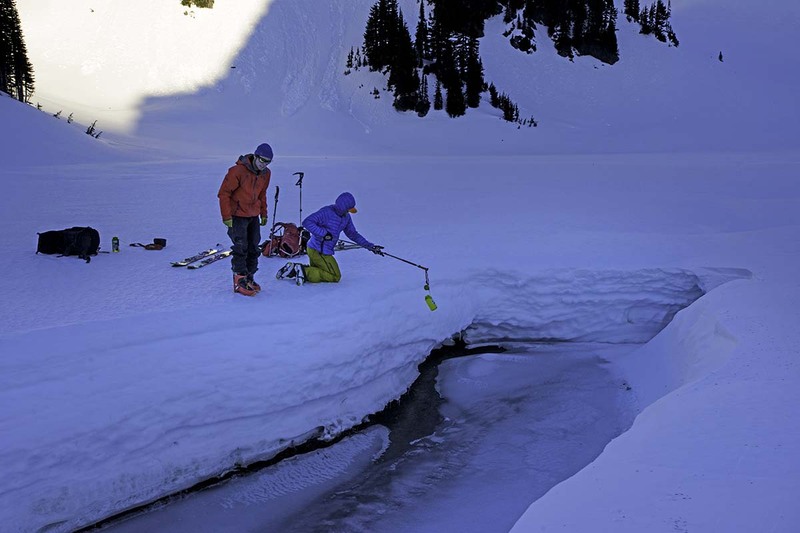 A probe also is useful for measuring the total snow depth and assessing snowpack—it has centimeter tick marks on the side to help. The Black Diamond Quickdraw Tour Probe 240 and Voile Tourlight Avalanche Probe 260 are two popular and user-friendly models. The final step in freeing an avalanche victim is digging them out with a shovel. This one is pretty straightforward but again takes practice. 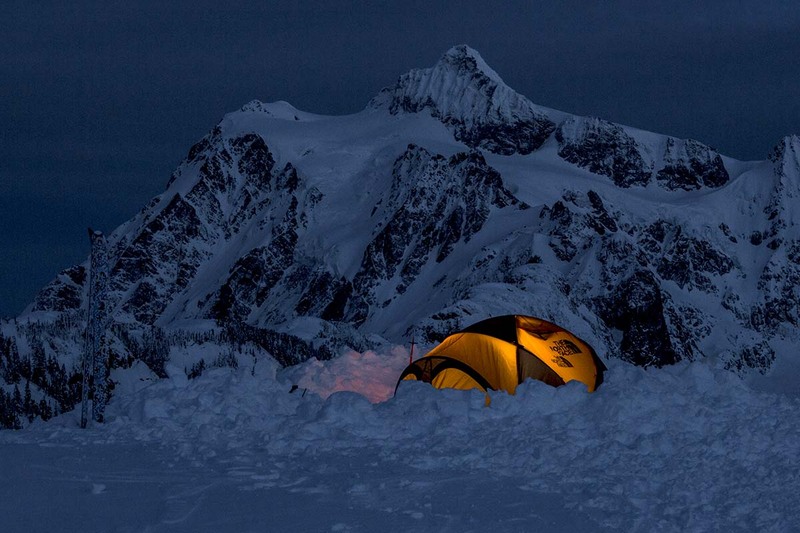 Avalanches aside, your shovel can be used to construct walls for protecting your camp from strong winds, building a snow kitchen, or digging a snow shelter for extra warmth and “luxurious” winter camping. It is important to choose a shovel that is lightweight and compact enough to fit into your backpack, but also durable enough to chop through rock-hard ice and snow. Two shovels that fit the bill are the Black Diamond Deploy and Backcountry Access B-1 EXT Bomber. When your ski boot liners or the insides of your mountaineering boots become damp from a full day of travel through challenging terrain, there’s no better feeling than slipping into a pair of fresh socks and down or synthetic booties. Booties are the equivalent of a camp shoe for backpacking, except they’re warmer and don’t have a true sole since snow is quite gentle on the bottom of a shoe. We like the Western Mountaineering Standard Down Bootie for its grippy sole and foam insole that makes walking on snow and ice feel super secure. 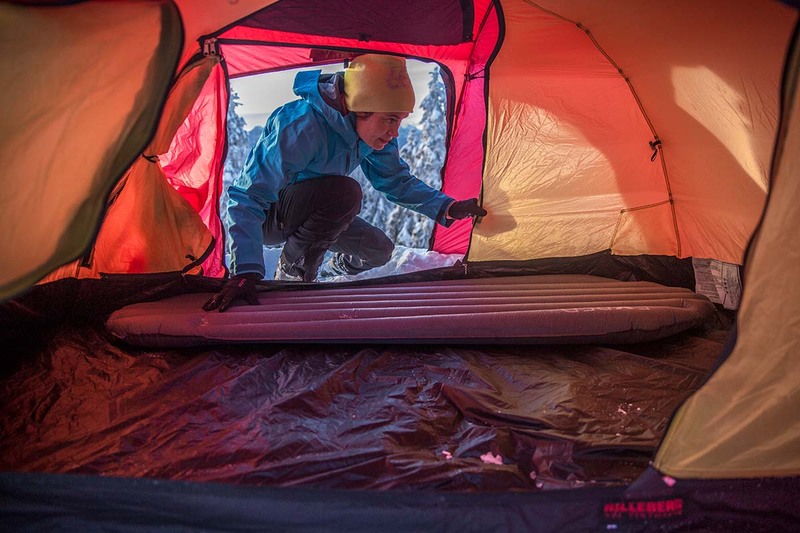 For $40 less, try the Baffin Base Camp, a synthetic option with less traction but adequate insulation. If your pants or mountaineering boots don’t come with built-in gaiters, we recommend bringing along a waterproof pair to keep snow out of your boots. Some backpacking gaiters only go up above the ankle, but for winter, we highly recommend full-height gaiters that extend to just below the knee. And double-check that they fit over your boots or ski boots since some gaiters are built too small or narrow for this. Winter landscapes are begging to be photographed. We get asked about cameras all the time and there is no simple answer: professional-grade cameras are heavy and expensive, but also take far better photos than point-and-shoots or your phone. If you are willing to carry the extra weight of a camera body with lenses, a full-frame camera or compact mirrorless model are great options. For true ounce counters who still want quality photos, the Sony RX100 series has been popular among outdoor enthusiasts for years. We had mixed feelings about putting a thermos on the “optional” list, but because of its heavy weight, we understand if it doesn’t make the cut. 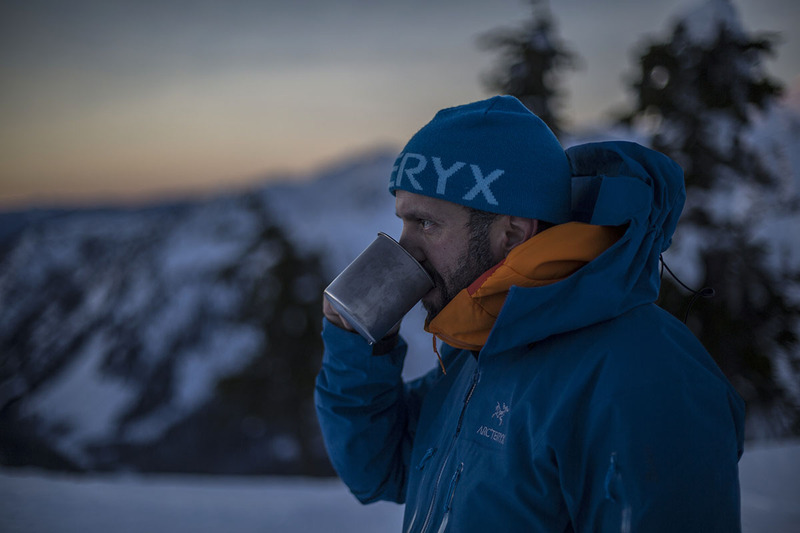 A thermos is a luxury item, but we personally wouldn’t sacrifice it, especially in the winter when a steaming cup of hot chocolate halfway into an eight-hour trek can really improve morale. It is also nice going to bed with a full thermos of hot water or herbal tea should you wake up shivering in the middle of the night. Our list above covers the essentials and a few things that are really nice to have, but we have a few more items in our packs on our winter camping trips. Some are for more technical adventures (like an ice axe and crampons), while others just make us a bit more comfortable in otherwise extreme conditions. Don’t forget these bits and pieces before you set off on your snow-packed adventure. Being Seattleites, we do much of our gear shopping at REI Co-op. The selection is excellent, the staff generally are knowledgeable and helpful, and you get the brick-and-mortar bonus of over 150 actual stores around the country. Another good option for winter gear is Backcountry.com, which has free two-day shipping on orders over $50 and a solid selection overall, especially when it comes to certain brands that you will have trouble finding elsewhere. For cheaper items and those who need gear quickly, it’s hard to beat Amazon.com and the sheer volume of sellers and product options. Last but not least, we always support buying gear at your local shop. It’s a great way to support the community, get information about your trip, and try things on in-person.